You can configure a maximum number of the session your application support and then Spring security will automatically detect if user breach that limits and direct them to invalid session url you have specified with this tag e.g. to a logout page. 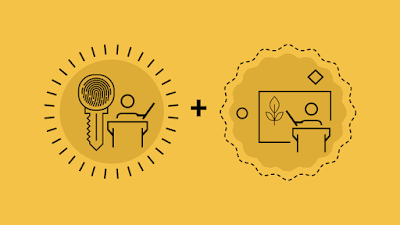 Similar to this, Spring Security provides lots of Out of Box functionality a secure enterprise or web application needed for authentication, authorization, session management, password encoding, secure access, session timeout etc. In our spring security example we have seen how to do LDAP Authentication in an Active directory using spring security and in this spring security example we will see how to limit the number of session user can have in Java web application or restricting concurrent user session. As I said it’s simple and easy when you use spring security framework or library. In fact is all declarative and no code is required to enable the concurrent session to disable functionality. You will need to include following xml snippet in your Spring Security Configuration file mostly named as applicaContext-security.xml. You can name the file whatever you want but just make sure you use the same name in all relevant places. If you are not sure how to enable Spring Security in Java web application, check that article first. As you see you can specify how many concurrent session per user is allowed, a most secure system like online banking portals allows just one authenticated session per user. The Max-session specifies how many concurrent authenticated session is allowed and if error-if-maximum-exceeded set to true it will flag an error if a user tries to login into another session. You can even specify a URL where the user will be taken if they submit an invalid session identifier can be used to detect session timeout. The session-management element is used to capture the session related stuff. This is just an example of what Spring security can add into your Java web application. It provides many such advanced and necessary features which can be enabled using some XML tag or annotations. If you are interested to learn more about advanced Spring security features, I suggest you go through Learn Spring Security course by Eugen Paraschiv, which the most up-to-date online course on Spring security and covers new security features from Spring Security 5 release. This code has a dependency on the spring-security framework. You need to download spring security jar like spring-security-web-3.1.0.jar and add into application classpath. This simple example of spring security shows the power of spring security, a small piece of xml snippet can add very useful and handy security feature in your Java web application. I strongly recommend using spring security for your new or existing Java web application created using Servlet JSP. That’s all on how to limit the number of user session using spring security in Java web application. Let me know if you face any issue while implementing this security feature in your project. How to implement Role-based Access Control in Spring Security? How to enable Http Basic Authentication in Spring Security? How HttpBasicAuthentication works in Spring Security? P.S - If you like to learn from a book, then Pro Spring Security by Carlo Scarioni is a good starting point. The content is not advanced enough for senior developers but for the junior and intermediate programmer, it's a great book. P.S.S - Also, If you are an experienced Java/JEE Program and want to learn Spring Security end-to-end, I recommend Learn Spring Security course by Eugen Paraschiv, The definitive guide to secure your Java application. It's useful for both junior and experienced Java Web developers. How does this work in a clustered environment? Does this handle browser close or browser crash scenarios? If we set the max-sessions=1 and if we close the browser without logging off, can the user login again immediately? @Sashika, it doesn't handle browser close scenario. 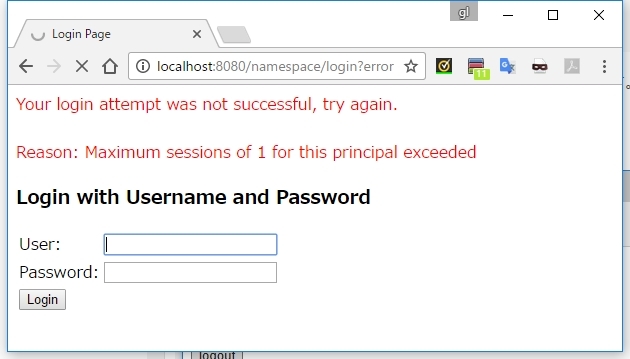 If user closes its browser without logging off from application, his user session will be active on Server and all subsequent login from same user will be denied as "maximum active session is 1". By the way this feature is called Spring Security Concurrent Session Control and available from Spring security 3.0 in declarative format as mentioned in this tutorial. I agreed with Writer that this is the easiest way to implement Concurrent Session Control on any Java web application but this feature requires a central Session Repository and if you are running on Two cluster where Session replication is not available and both Cluster have there own session repository, you will end up with Concurrent multiple User session. I am not sure if you can customize this behavior by implementing your own Session Repository, If you have any idea please jump in. how to enable Spring Security in case of browser close or browser crash scenario....?? Hello Neethu, what is the error you are getting? some more information would be helpful because its spring spring security feature not core spring framework. @arnab, there is a setting for that which allow multiple active session, as discussed on my post how to control active session in Spring security. You can configure it depending upon your requirement. is possible from same browser e.g same user can login multiple times from same browser how can I stop user from second time login from the same browser e.g IE if that user is already logged ? How can stop concurrent login for a specific user the above code is common to all user ? How can i throw custom error messages in spring-security if the user tries to login for second time?